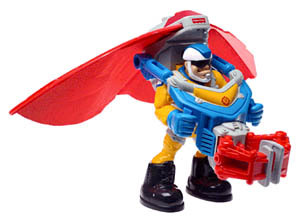 Rescue Heroes Cliff Hanger - Fisher-Price makes a whole series of cool Rescue Heroes action figures, including Cliff, the Air Rescue Specialist. Push a button on the top of his glider backpack and out pops his toy hang-glider-like red wings (this pack is removable and can be worn by other Rescue Heroes figures). Cliff has big feet for steady landings, a rescue clamp that automatically closes around objects, and movable body parts. He stands about 8 inches high and is made from sturdy stuff so he can withstand crash landings at the hands of exuberant 5 year olds. It's fun and durable. Leap and soar, glide and swoop. Cliff Hanger uses his jet-powered hang glider to catch air currents and to fly to wherever people need help. Then, with is great clamp he lifts and carries them to safety. So if trouble's in the wind, Cliff's just the hero to help.